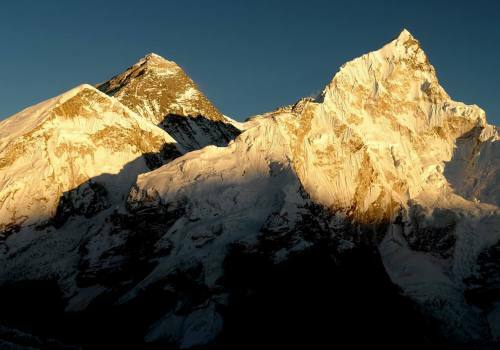 Few visitors to Nepal have even head of the Mardi Himal Trek, let alone ventured onto its path. Let its reputation of hardly being known pull you closer and not push you away. 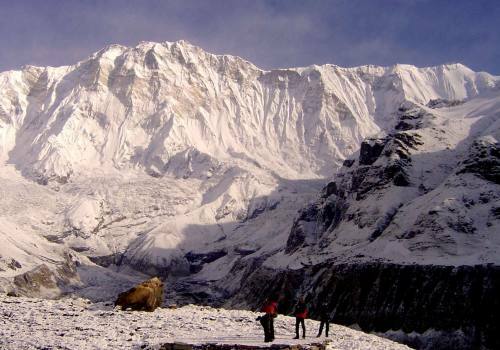 It is the least visited trail in the Annapurna region. Because of this, you will get to more closely interact with the locals and have a more meaningful experience. The short Mardi Himal Trek has it all: mountain views, charming local villages, and lush vegetation (including Nepal’s famous rhododendrons!). 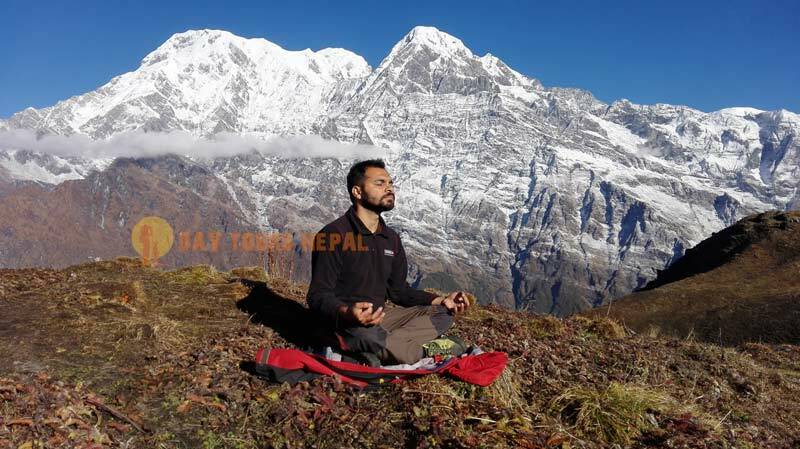 The short and sweet loop trail lies in the eastern part of the Annapurna region. At its highest point, 4500 meters / 14,764 feet, spectacular views of Mardi Himal (5587 meters / 18,330 feet) and a myriad of other peaks surrounding you. After a short drive from Pokhara, the journey begins. The fresh air as we pass through the dense forests gives us energy. It is a special kind of energy that we feel during the foothill excursion. During the springtime, the sheer brilliance of the rhododendron flowers (native to Nepal’s Himalayas), will put you in awe. Between 1,400 and 3,600 meters, you can find entire forests of them! As we make our getaway further up, the landscape changes dramatically. From the dense sub-tropical jungles, we break out onto a ridge above the rolling plains. Now, it is just open air between us and the mountains. At Upper Viewpoint, we are overcome with a feeling of amazement. 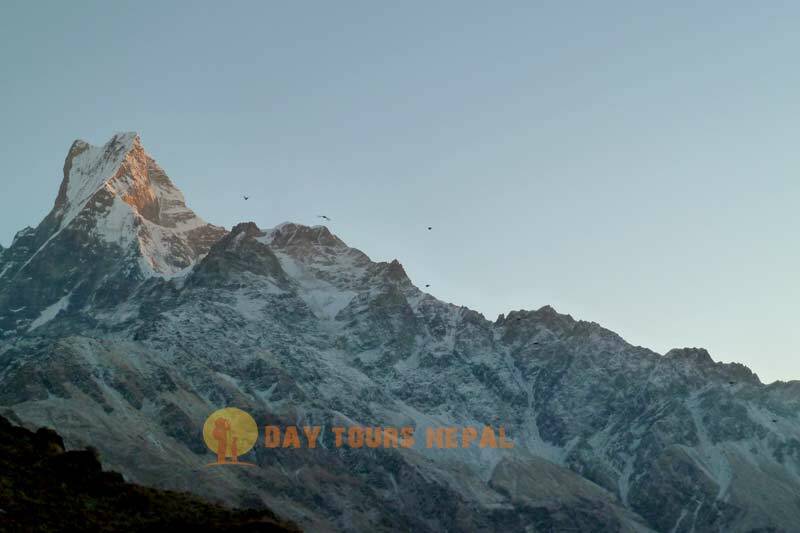 We can see Mardi Himal, Macchapucchre (6993 meters), Hiunchuli (6441 meters), Baraha Shikhar (7647 meters), Singu Chuli (6501 meters) Annapurna I (8090 meters), and Annapurna South (7219 meters). 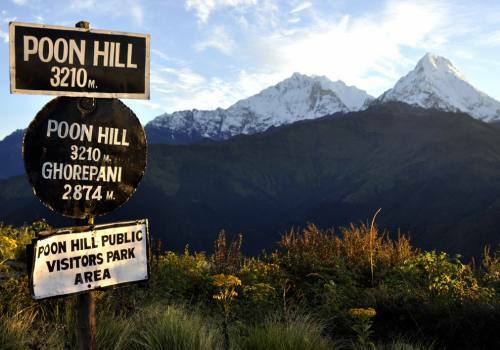 Climb even higher through the alpine meadows to Mardi Himal Base Camp for even more astonishing views. 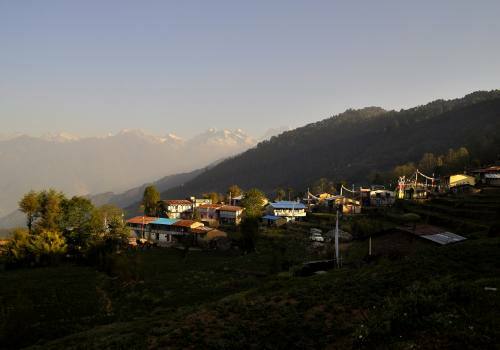 An entire panorama of the Annapurna range fills our view. Soak in the views and shoot some photos before we begin the descent. On the way down, we take a new route, so the scene is always fresh. Upon arrival in Lumre, we drive back to Pokhara and then to Kathmandu. Pokhara where we start and the trek ends. 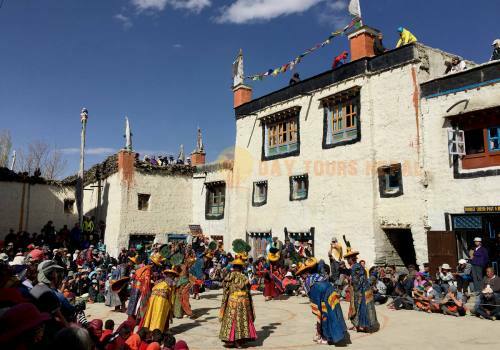 Dhampus village, Pothana village, Forest Camp, Rest Camp, Low Camp, Badal Danda, High Camp, Mardi viewpoint, Mardi Himal Base Camp, and Sidding village. Trekking is possible throughout the year, but Spring (March to May) and Autumn (September to November) provide the best weather. During the Spring, there is a bit more color and the rhododendrons are blooming, and in the Autumn months, the skies are generally clearer. During the monsoon season, though, there are fewer tourists. Each season has its perks. The Mardi Himal Trek requires adequate fitness and acclimatization to avoid acute mountain sickness. 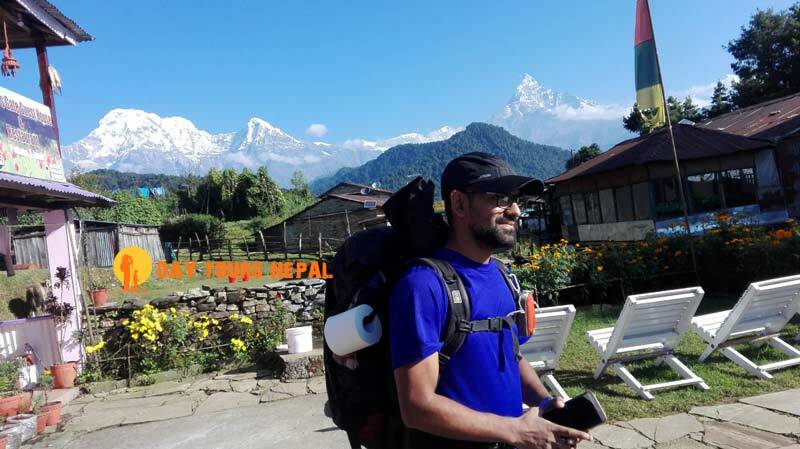 Why trek to Mardi Himal? 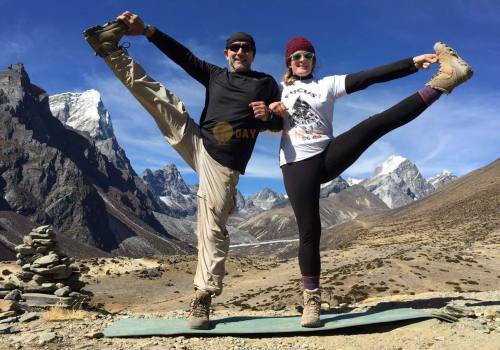 The relatively recently developed Mardi Himal Trek is a low-budget, quiet and peaceful trail that brings trekkers up close to the famous Machapucchre (Fishtail) peak. 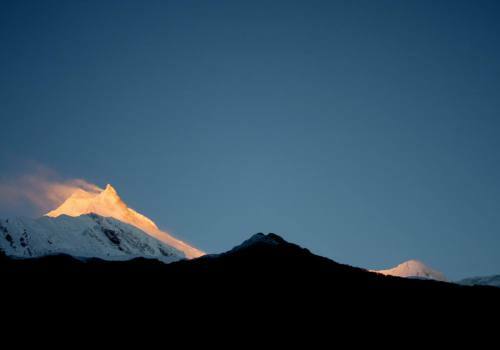 The few that come can still enjoy the beauty of the beloved Annapurna region while remaining away from other tourists. Adventurers of all experience levels can take on the Mard Himal Trek, even if it’s your first trek ever! Oh, and it can be finished within a week of arriving in Pokhara! Day 01:Pokhara drive to Phedi (1,130 m) 3,708 ft 18.7 km (11.6 mi) and Trek to Pothana (1,950 m) 6,398 ft. 5 hrs walk Get ready to start the first day of the trek to Mardi Himal after breakfast. The day starts with a short 30 min drive to Phedi to embark on trekking journey. Our destination walk for the day is to Pothana, a beautiful overnight place with the spectacular Himalayan view from the viewpoint just above the camp. The walk is short and peaceful today. Only after about four hours of walk, you reach Pothana to stay overnight. We will be walking via Dhampus village, is at 1,650m (5,414 ft). You will enjoy the walk through a lush forest, local village, and peaceful surroundings. Day 02:Pothana Trek to Forest Camp (2,600 m) 8,531 ft via Deurali (2,100 m) 6890 ft. Distance; 5 hrs walk. Many people skip Pothana because they are not aware of the viewpoint of Pothana. 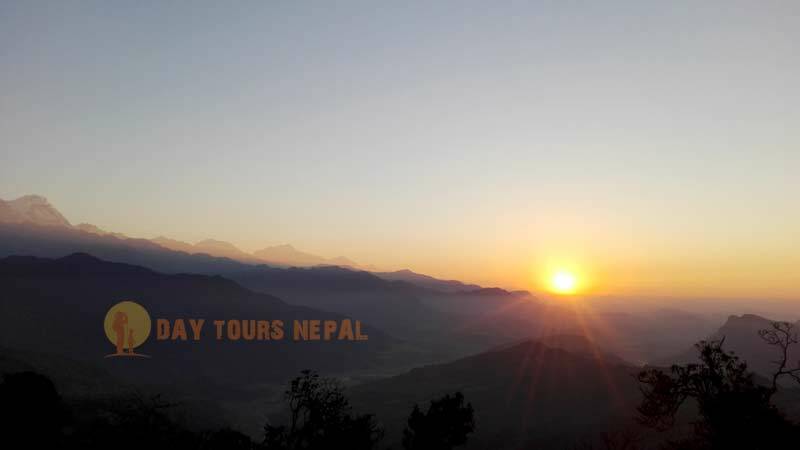 Our day starts quite early because of sunrise and panoramic mountains view from the Pothana viewpoint. A short 15-20 min walk to see the sunrise. After breakfast at Pothana, we will start our next destination Forest camp passing through the beautiful green forest. From the Feb and end of March rhododendrons, flowers will come along the way. If there will be room at the Rest Camp then our guide will take you there which is 30 min walk. From rest camp we can see fishtail and the sunrise in the morning. Day 03:Forest Camp Trek to High Camp (3,580 m) 11,746 ft via Low Camp (2,990 m) (9,809 ft). Distance; 5-6 hours Our day will start around 7;30 to 8 in the morning after breakfast. If we stay at Forest camp you will not see mountains but can see the sunrise (depends on season) so peaceful morning where you can meditate yourself. The trail up to Low camp is walking into the green lush forest. From Low camp, we can see the Fishtail mountain and we will have a short break here. A gentle walk up to Badal Danda (could hill) after the break and this is the place where we going to stop for lunch. On a clear day, we can see the beautiful mountain view including Annapurna south, Heuchuli, and Fishtail. 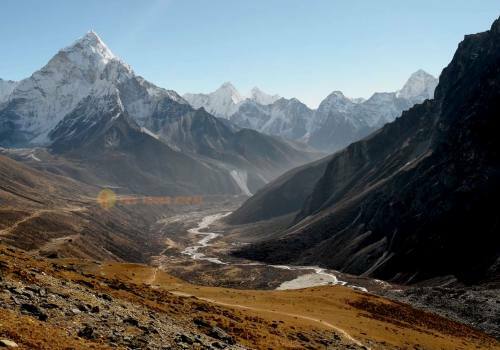 From Badal Danda to High camp is about 1 and half hour maximum but the landscapes are just amazing and you will be surprised with Mardi Himal trek trail. From High camp also we can see the mountain view. Next morning needs to wake up early so better to go to bed early after dinner. Day 04:Morning Hike to Mardi Himal Base Camp (4,500 m) 14,764 ft and Trek back to Badal Danda (3250 M) 10663 ft. Distance; 6 hours Our plan is to walk early morning to the Mardi Himal viewpoint (4,200 m) 13,780 ft to see sunrise and Mountains. The guide will tell you the time before going to bed. Bring the headlight with you because need this morning. The trail to Mardi viewpoint and base camp is well established but also in the dark need to be careful and follow the guide instructions. Enjoy the morning view at the Upper viewpoint and then hike back to High Camp. You can buy Tea and Coffee at the Viewpoint in the morning but we will have breakfast at the High Camp. After breakfast, we will trek back to the Badal Danda where we had lunch a day before. Badal Danda is another best viewpoint on this trails so enjoy the evening watching Yaks, sheep’s gazing around. Sunset view is beautiful from here. 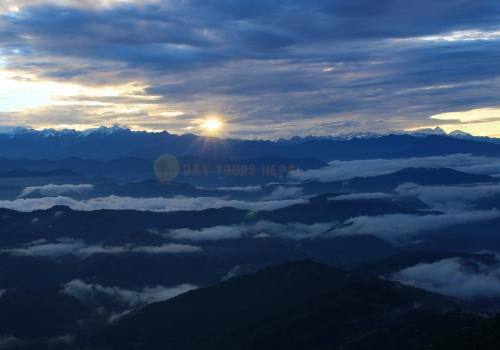 Day 05:Badal Danda Trek to Siding (1,750 m) 5,742 ft and Drive to Pokhara (827 M) 2,713 ft Distance; 3 hrs walk If you want to see the last sunrise in the Himalayas then wake up early and climb 10 minutes from the lodge where you can see the beautiful morning view. After breakfast, 2-3 hours walk down to the siding village via Low Camp. Normal trek itinerary put low camp but we don't suggest people because of the view from Badal Danda. Descending all the way down to the Siding, after lunch at siding we will drive back to Pokhara. Roads are not paved so it's bumpy! Enjoy your evening at Pokhara with the lakes and having a nice meal in meals in the restaurant. Accommodation during the trek (local lodge). 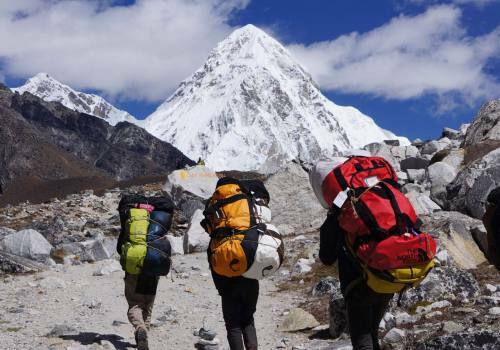 Porters to carry trekking bags, and duffle bags. 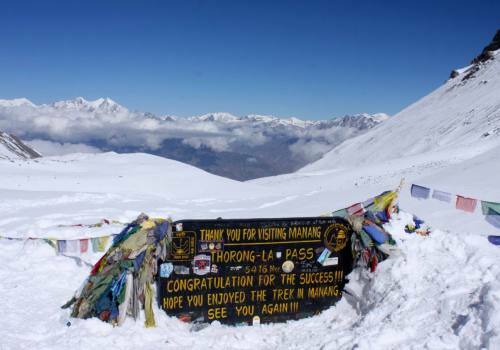 Annapurna Conservation park, and trek permit. Table drinks, snacks, personal travel insurance, in case of an emergency. Obviously you will be in higher elevation while trekking in Nepal. The weather will be different in every region but also have to pack the proper trekking equipment. 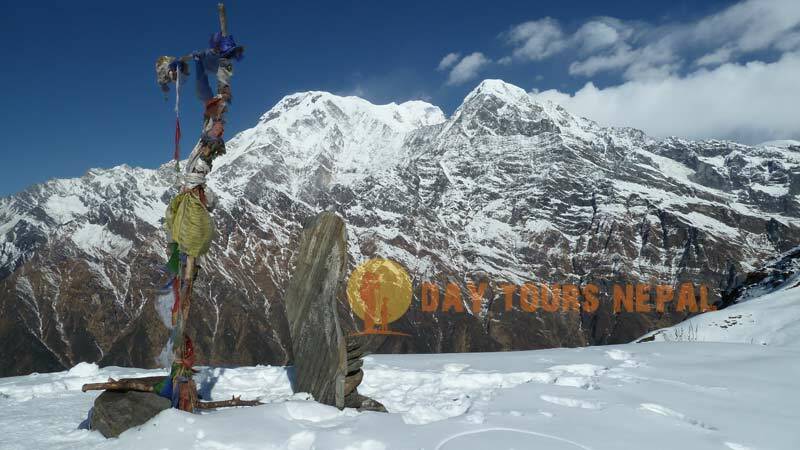 Day Tours Nepal is selling Nepal’s Top Best selling treks and all are Tea-house Trekking so you don’t need to think of Camping gears. While buying clothing please pick warm clothing especially during the winter season (Dec-Feb) in Nepal. We also suggest you to get the proper light backpack and have enough space to pack your stuff. If you are confused to buy the Trekking gears than no worries you can buy the Trekking equipment in Nepal too. 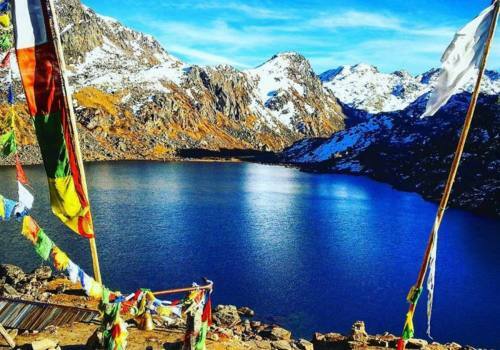 We recommend you to get check the below list for Trekking in Nepal. You can simply choose food from the menu. Most of the Tea houses prepare local meals to western meals like Piza, Pasta, Spaghetti. If you are vegetarian or Vegan then our guide will suggest the food and also it's possible. You will get fresh vegetables and of course the traditional Nepalese food Dal Bhat. For meat lovers, you can get meat but after a certain place, we suggest not to eat meat. Meat will not be fresh and it's carried from the city but the guide will suggest if it's okay to eat. Trekking lodge or teahouse in Nepal? Lodges or Teahouses accommodation is run by a local family. If we forget some nice luxury lodges then the normal lodges have private rooms with 2 beds or 4 - 5 beds like a dormitory. Some teahouses have attached bathrooms but please don't expect everywhere. Nowadays in Mardi Himal, Annapurna Base Camp, Poonhill, Everest and some other places lodges are upgraded with new amenities. During the peak season, it will be quite tough to get private rooms but we will try our best to manage. Squat or Flush? some places have flush and some places are with a squat toilet. Drinking water directly from the tap is not recommended for the trekkers. Normally you can buy filtered water, mineral water, and boiled water on the trail. We request our trekkers to carry water purification tablets (if you are used to with the tablets). There is a big problem of plastic bottles around the trail so it's our request for trekkers to use other options. Our Guide will get the fresh water from the tap if you use purification tablet. In some places, both are not worth to use in that case buying water bottles is safe.